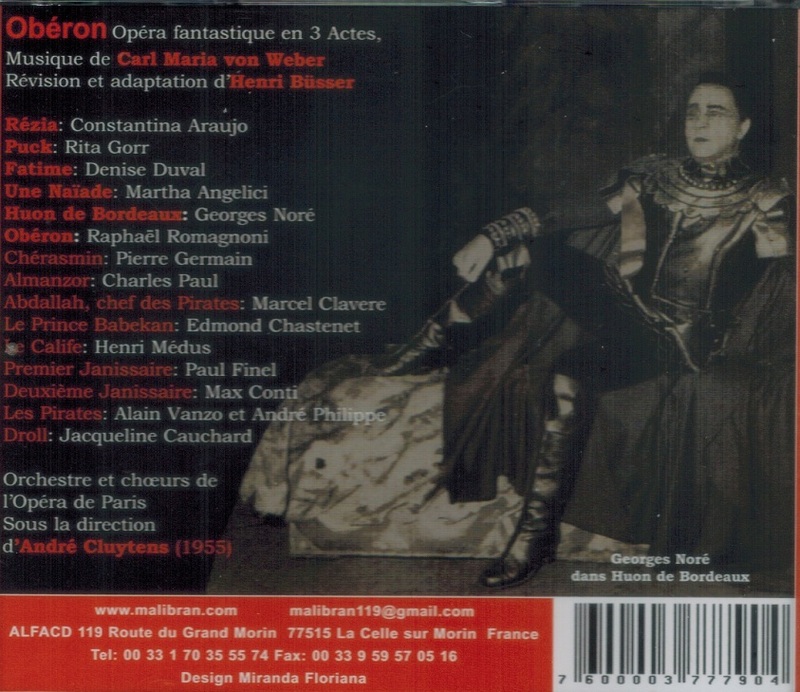 “In 1955, the role of Huon was taken with all the valor required by Georges Noré, a French tenor unjustly forgotten today, even though Sir Thomas Beecham choose him for the title role of FAUST, recorded in 1947. Although seen as the successor to Thill, in 1960 he took a somewhat premature retirement. A complete discovery with the Brazilian soprano Constantina Araujo; the world hardly had time to enjoy her beautiful voice, as this singer born in 1922 died in 1966 to pulmonary embolism, fortunately having had time to sing Aïda at La Scala in 1951 (with Mario Del Monaco) and then to Paris in 1954 between two representations of OBERON. Rita Gorr was Puck, [luxury casting] in this fairly small role. Martha Angelici appeared as Naiad and Alain Vanzo made his l’Opéra début as a pirate. “Constantina Araujo was a Brazilian spinto soprano who studied classical singing with Professor Murino at the Dramatic and Musical Conservatory. She began her musical career in the former Radio Gazeta station that had an auditorium where complete operas were performed in concert form. "Martha Angelici was a French operatic soprano of Corsican origin, particularly associated with the French lyric repertoire. While still very young she moved with her family to Belgium, where she studied voice in Brussels with Alfred Mahy. She began singing for the Belgian, Dutch and Luxemburg radio in 1933, and gave her first public concert at the Kurzaal of Ostend in 1934. Her first stage performance was in Marseille, as Mimi in La Bohème, in 1936. She made her début at the Opéra-Comique in 1938, where she had a long and successful career, and made her début at the Palais Garnier in 1953, as Micaëla in Carmen, other notable roles included Leila, Pamina, Nedda, etc. She made a few guest appearances at the Monte Carlo Opera and La Monnaie in Brussels. She was also much admired in French baroque music notably in Rameau's Les Indes Galantes, and was much loved as a concert singer, especially of Corsican songs. She was married to the director of the Opéra-Comique, François Agostini." “Raphaël Romagnoni, who in the course of a long career would become one of those 'essential tenors' who are regarded as 'pillars' of our Parisian opera houses, made his début at the Grand Théâtre in 1931 in CAVALLERIA RUSTICANA. His beautiful voice with its generous top notes lead to many engagements in the provinces and North Africa until World War II. In his first year at the Opéra, he sang Roméo, the Duke of Mantua, Mylio and Faust, a role that he performed with great success for several years. 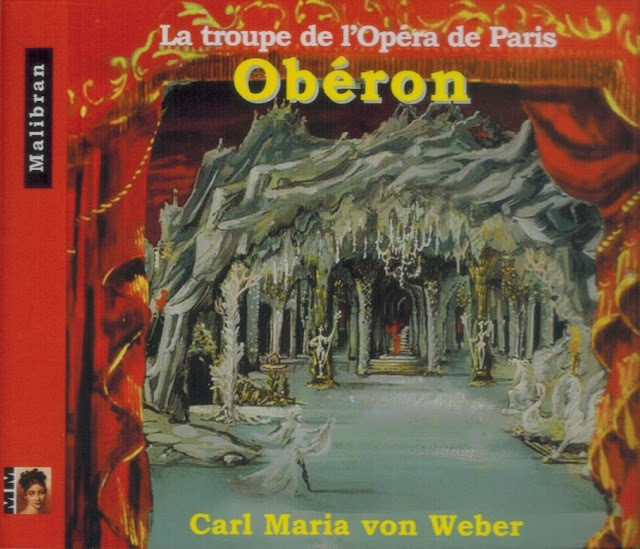 There followed the creations at the Palais Garnier of JEANNE d’ARC AU BUCHER in which he sang the rôle of Bishop Cauchon in all 93 performances with Claude Nollier and six times with Ingrid Bergman (Jeanne), and successively with Jean Vilar, Henry Doublier and Robert Vidalin (Frère Dominique). Later would come LES CONTES D'HOFFMANN in which he sang the title role and, at the end of his career, Spalanzani. He made his début at the Salle Favart in 1947 where he sang Don José, Des Grieux, Werther, Gérald, Hoffmann, Nadir, Pinkerton, Turiddu and Rodolfo in LA BOHEME and Alfredo in LA TRAVIATA. At the same time as his Parisian activities, he toured the big provincial towns and also abroad."